A statue of Wiebbe Hayes, commemorates the hero of the Batavia mutiny off the Western Australian coastline in 1629. 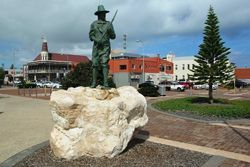 In recognition of his role the Batavia Coast Maritime Heritage Association (BCMHA) raised funds and arranged for the sculpting and casting of the statue. 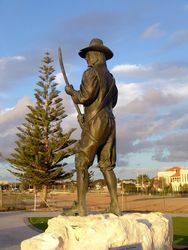 Their efforts came to fruition in November 2009 with the unveiling of the statue in Geraldton. 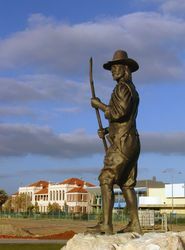 Costing $50,000 (provided by the BCMHA and City of Geraldton-Greenough), the statue shows a defiant Hayes bearing one of the pikes the Defenders had made. 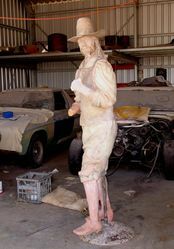 The honour of unveiling the statue fell on someone with a famous connection to the Batavia, Max Cramer, who co-discovered of the wreck on 4 June 1963. Jeronimus Cornelisz conspired to mutiny and steal the treasure-laden ship before it struck a reef. The mutineers murdered more than 120 shipwreck survivors before most were captured, tried and hanged for their crimes. Five days after the wreck of the Batavia at the Houtman Abrolhos Islands in 1629, Commander Francisco Pelsaert and skipper Arien Jacobsz with forty six others left in the ship's longboat to search for water, ending up in Batavia (Java, Indonesia) and not returning for three and a half months. In their absence VOC's undermerchant Jeronimous Cornelisz assumed control of the 200 survivors marooned on Beacon Island and he and his accomplices embarked on a reign of terror and murder. 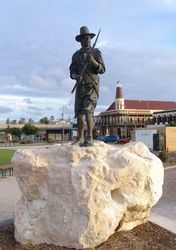 Cornelisz isolated soldier Wiebbe Hayes and some twenty others on East Wallabi Island, expecting they would die, but they crossed to West Wallabi Island where they found water and food. 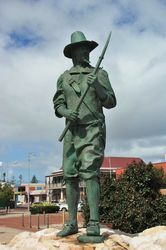 Escapees from the bloodshed on Beacon Island alerted Hayes, and he organised the defence of his companions, repelling attacks from Cornelisz and eventually capturing him. When Pelsaert returned, Hayes raced ahead of the remaining mutineers to warn him of their plans to overwhelm the rescue ship. 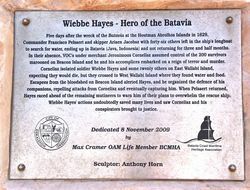 Wiebbe Hayes actions undoubtably saved many lives and saw Cornelisz and his conspiritors bought to justice.